In the Upper East Side we encountered this beautiful apartment from my clients. Although the location and the architecture is amazing, this client is renting it short-term therefore we couldn’t make any major cosmetic changes. Luckily the canvas was clean and white, easy for us to add their personality and charm. The living room is an open floorplan with the dining and kitchen. To separate it from the rest we selected a long neutral sofa and anchored with a soft sheen rug and framed it with two marble base floor lamps. In addition, two coffee tables and two sideboards were added to accentuate the length. To control clutter, we stored gaming and remote controls in glass boxes. To offset the neutral and blush tones we included navy jean blue arm chairs for contrast. This may be a short-term rental, but my clients host a lot of guests, therefore we needed to add an 8 seat table for large dining parties. Timeless colors and clean lines with a touch of brass. Beautiful potted plants or flower arrangements are used to anchor the center because a chandelier was not an option. But we needed a chandelier moment and made it happen in the kitchen by replacing a simple light fixture with a graphic black finish pendant. It’s important to enter and leave your home on a positive note so we beautified what was a stark hallway with a long Persian runner, vintage finish mirror and added a unique walnut floating shelf for storage. Just as important is the bedroom; we created a minimal and serene room to relax and rest. The great thing about this midcentury home in Hyde Park, New York, was its near-pristine 1950s condition when my husband and I purchased it in November 2016. It was also in dire need of a complete overhaul. Much of the home was out of date and not up to code, but the potential was clear. Nothing less than a full gut renovation was in order. The dramatic results can be seen in each room of the house. The exterior flower bed was updated with gabion walls, plants and mid-century style pony wall with house number. We also replaced the deck and added cable railings. The color of the house was always red and we embraced it fully. The entry/foyer was gutted to include slate tile floors used in the era but we modernized it with custom bookcases instead of railings between the entry and ground floor. Tandem Eames chairs and funky accessories finishes off the space nicely. The original living room had dark wood paneling throughout but we wanted a crisp white space to highlight our view. Because we have pets and intend on growing our family, we selected engineered velvet in a dark color. Vintage mid-century pieces and art work is spread throughout; a growing collection which will continue to grow through the years. To add more of our personality in the space we selected Rio inspired cement tiles for the fireplace living room. I am Brazilian and my husband loved the pattern from the Ipanema Beach sidewalks that inspired the graphic design of the tiles below. Beyond the fireplace you can see our dining room with a Rosewood mid-century table and contrasting light oak chairs. Between the kitchen and dining room there was a wall and we removed it immediately and updated the cabinets, finishes and appliances. To warm what could be a stark white lacquer kitchen, we added terracotta tiles and different wood tones. The master received a fresh coat of paint and more mid-century pieces inspired by the house’s architecture. The master bathroom got a major face lift and the layout was altered to include a large bright shower and double vanity. There are two other bathrooms in the house. The retro bathroom received a fresh coat of paint and I replaced the mirror and light only but all else remained the same. The guest bathroom downstairs was a complete gut reno because it was non-functional (wall to wall carpeting!) and we modified it so it was en-suite bathroom attached to the guest room. Downstairs is our family room with a “FAMILY” rug to match. It also serves as my home office so I needed to add lots of storage that didn’t distract you when “off line”. Photos by Nick Glimenakis for Domino Magazine. The owner of this historic Park Slope, Brooklyn Brownstone was a busy mom with two little girls – and a third baby on the way – when I first met with her. Although the brownstone had fantastic potential, she didn’t have the time to make design choices. She wasn’t even sure where to start. The result was a sea of brown leather bachelor sofas, even after living in their new brownstone for six months. She needed the help of an interior designer to create a home that worked well with the historic architecture, and for her growing family. When making my initial walk-through of the Brooklyn, NY brownstone, I quickly noticed a few colorful pillows peeking out from the expanses of brown leather. What I discovered in my discussion with the owner was that she secretly loved color and patterns. She just didn’t possess the design confidence to know how to use patterns and more colorful elements. That gave me the insight I needed to design a home that worked beautifully for this New York family. With a clear directive from my client, I focused on bright accessories and lively patterns for the Brooklyn, NY home design. At each turn, I sought to contrast the traditional architecture of the brownstone with bold design and vibrant colors. In the dining room, there are patterned chairs around a modern table sitting beneath a traditional crystal chandelier. The centerpiece of the living room is a vividly colorful rug, which is contrasted by neutral furnishings around it. It’s bright but elegant; great for kids and guests. The den of this Brooklyn brownstone has plenty of storage for toys, a soft rug to play on the floor, fun bright art and patterns, (plus a great sofa for building forts). Filled with colorful art, accessories and antiques, the design of the home now finds the best balance between bright and neutral, and traditional with modern. The story of the design of this New York apartment in Chelsea begins as an empty-yish bachelor pad. The newly expanded apartment had a sparse, minimalist feel. Too minimalist for my client, who wanted a place that felt special, a place filled with objects that had personal meaning and purpose. This contemporary Flatiron office design reveals its industrial architecture with an open office layout plan. The new design doubles workspaces and revamped the conference room into a think tank. See the contemporary interior of the newly designed Strive Health center, a warm, inviting space for receiving quality treatment for addiction. Design for the commercial space included a break room, meeting room, lounge area, clinician’s office. New York interior design studio Ana Claudia Design helmed the project. Find inspiration for the interior design of a small New York apartment. Decorated by New York interior designer Ana Claudia Schultz, this small Manhattan condo makes the most of limited space. 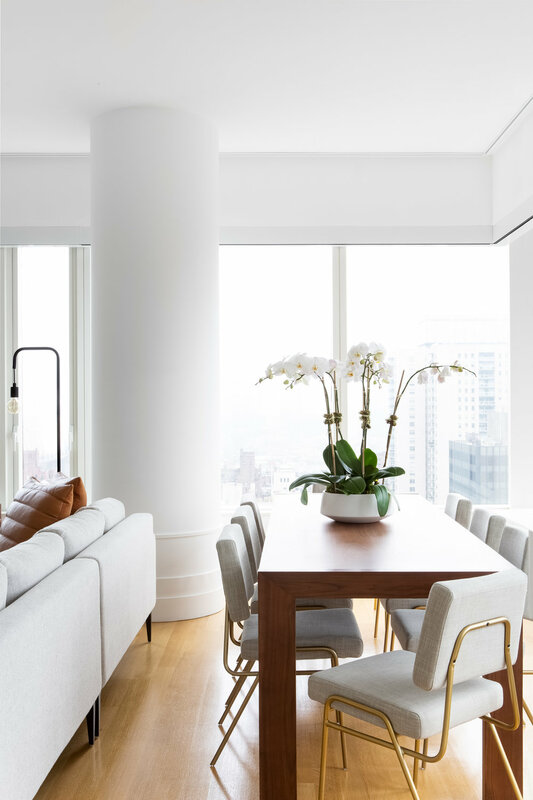 The Lexington Avenue apartment in New York City feel spacious with inspired modern patterns against a neutral background.